Like much of the construction industry, OSU relies on green building standards like US Green Building Council's Leadership in Energy and Environmental Design (LEED) program to build higher performance buildings. LEED equivalent is a requirement at OSU. Buildings must be built to a LEED silver equivalent and renovations must meet at least a LEED certified equivalent. Johnson Hall’s 62,000-square-foot interior includes a 125-seat lecture hall, state-of-the-art research and teaching laboratories, and a center focused on improving recruitment and retention of engineering students. Opened in Fall 2015, OSU's newest classroom building is a four-story, technology-rich learning environment, hosting over 2,300 general purpose classroom seats in 14 unique state-of-the-art classrooms including arena- and parliament-style classrooms, a variety collaborative learning environments, and 640 seats of informal learning space distributed around the building. The Outdoor Recreation Complex was finished by Homecoming 2010 and is an expansive updated section of campus featuring synthetic turf fields, lighting, a parklike setting, and a new event space. It also includes a new jogging track and will include the construction of new tennis courts. It is also a more sustainable space because of the planting of more than 60 trees on the site and the use of the synthetic turf will eliminate the need to to watering or use chemicals and fertilizers. As an outdoor facility, the project meets all University and City requirements for stormwater quality and detention. The lighting, described more fully below, is specified meet the “dark skies” requirements and provide energy savings measures. The pavilion, restrooms, and storage building incorporates daylighting, occupancy sensors, low-flow fixtures, and solar hot water features. Selected materials and furnishings are considered on a sustainable basis, including use of certified woods in the benches and recycled content within the synthetic turf. The image below refreshes every minute. Like the Asian & Pacific Cultural Center, the BCC also opened in April 2015. The center is located on Monroe Street, near the intersection of 25th Street. Construction began after the BCC moved out of the old building on Monroe Street. The center’s new building was designed by the Seattle architectural firm of Jones & Jones, which has designed all of OSU’s new cultural center buildings. The original Black Student Union Cultural Center was formed at OSU in 1975 and later renamed the Lonnie B. Harris Black Cultural Center after the first director of the Educational Opportunities Program, which originally helped increase recruitment and retention of black students. The $2.4 million, one-story, 3,500-square-foot building features a circular lounge and exterior brick patterns based on Yoruba textiles known as Aso Oke, from Nigeria. More information about the BCC can be found here. The 18,000 square-foot Hallie Ford Center was constructed for the College of Healthy and Human Sciences in 2011 and 2012. It is to become a hallmark of campus and will feature collaboration among many disciplines. The ground floor includes a welcoming common area, office of the endowed director of the Center, a family style living area, conference room, and kitchen. Offices for Research Core directors and others are located on the second floor interspersed with common areas conducive to spontaneous conversation and small meetings. Follow this link to watch the time lapse construction video. The $62.5 million, 105,000-square-foot facility broke ground in September 2009 and held its grand opening in October 2011. It is built to meet LEED Silver requirements and includes the extensive utilization of natural light, heat recovery and use some solar equipment. It will house the Linus Pauling Institute and chemists from the College of Science, and contain classroom and laboratory space for students and researchers studying chemistry, biology, and life sciences. Built in 1899, Kearney - formerly Apperson - Hall underwent a $12 million renovation in 2007 and 2008. Kearney is registered for and expected to achieve a LEED Gold rating by the US Green Building Council. Attempting to preserve its historical significance as well as reduce the need for new materials, the granite and sandstone shell remained almost completely intact during the extensive renovation. Exposed walls and ceilings will allow the building to be used as a 'living classroom' for generations of new engineers. Kearney will aide the College of Engineering in its quest to be one of the top-25 engineering schools in the nation. See more information from the College Planning & Management article. The $80 million Reser Stadium renovation, prior to the 2005 season, added and expanded a new east side section. The structure includes numerous state-of-the-art amenities, including the spacious Club and Loge levels. Air conditioning economizers that use fresh air when outside temperatures are below 72 degrees F.
Check out the complete list on the fact sheet and watch the renovation time lapse. 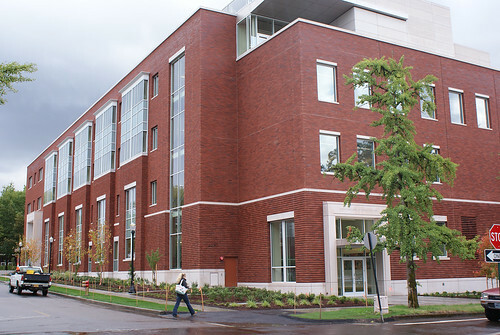 The Kelley Engineering Center, which opened the summer of 2005, is the physical centerpiece of the OSU College of Engineering drive to become one of the nation's top-25 engineering programs. The building's design is centered on communication, innovation and responsible environmental design. Kelley Engineering Center is certified LEED Gold from U.S. Green Building Council, making it the “greenest” academic engineering building in United States. The four-story, 153,000-sq.ft., $45 million building features extensive sustainable "green" design elements, used to educate students and others about sustainability and renewable energy issues. Originally constructed in 1928 then closed in 1994, Weatherford Hall is a landmark building that reopened in 2004 after an extensive historic renovation. The LEED-registered remodel is home to one of the first residential colleges on the west coast. It is a collaborative effort of the College of Business, the College of Engineering, and University Housing and Dining Services. Constructed in 1979, Magruder Hall has undergone a series of renovations in recent years. In 2004, the 28,060 square foot Small Animal Hospital Addition was completed, which added a two story hospital wing and remodeled a portion of the original building. For more information, see the Large Animal Hospital Addition Sustainability Report. OSU's 1920s era heat plant provided steam to most campus buildings until 2009 when the new OSU Energy Center went online, producing steam and electricity to efficiently heat and power OSU's main campus. This co-generating, or combined heat and power (CHP), technology greatly increases efficiencies by utilizing waste heat from the electrical generation process. This "waste" heat it utilized to heat campus buildings. Additionally, the close proximity of the electricity generating source to electrical loads on campus means transmission line losses are greatly reduced, improving overall efficiency of the electrical grid and postponing the electric utility company's need for increased capacity. Energy Center systems are configured for future use of renewable fuels, such as biodiesel and methane. CHP facilities are becoming more widely adopted because of high efficiency and enhanced reliability. This facility will reduce OSU's emissions of nitrogen oxides (NOX), carbon monoxide (CO), and greenhouse gases. The Energy Center building was designed to LEED green building standards, and in January 2011 received a Platinum rating from US Green Building Council. The New Student Residence is a five story, 85,000 square foot residence hall located on the east side of campus, directly south of Wilson Hall. The building, which opened in Fall 2014, consists mainly of three bedroom suites. Each suite consists of three double occupancy bedrooms with a small common area and shared bathroom.Overall, the new residence hall houses over 300 students. The building is named after the first black male graduate from the University, William Tebeau. The Samaritan Sports Medicine Institute (SSMI), which opened in December 2014, is an 18,000-square-foot clinical sports medicine facility. It is located on a portion of the existing Reser Stadium Parking Lot on the east side of 30th Street, just north of Oak Creek. The facility provides sports medicine services to OSU student athletes primarily, but it also serves OSU personnel and the broader community. In addition to providing sports medicine services, the operating agreement with the service provider is anticipated to identify educational opportunities for OSU students, particularly for those in OSU’s College of Public Health and Human Services. Opportunities for collaboration between OSU faculty and sports medicine clinicians are also likely. Completed in Spring of 2015, the Student Experience Center is a four story, 87,900 square foot building with a full basement located on the corner of Jefferson Way and Waldo Place. The building is designed to house multiple student organizations including the student government offices. The basement houses the craft center and building services. Floors 1 to 3 have multiple suites for the student offices. Student media, including the radio and television stations is located on the fourth floor. In conjunction with the building, a covered plaza was also built between the Memorial Union and the Student Experience Center. You can learn more about the SEC here. The Asian & Pacific Cultural Center celebrated its grand opening in April 2015. The 3,500-square foot center, located just east of Austin Hall, cost $2.4 million to complete. The new building was designed by Jones & Jones Architecture of Seattle, the designer of the other three cultural centers — the Eena Haws Native American Longhouse, the Centro Cultural Cesar Chavez (both now open), and the Lonnie B. Harris Black Cultural Center which was also just completed in spring of 2015. The building's exterior has characteristics of housing styles found in some of the regions represented by the cultural center.Like the other cultural centers, the new Asian & Pacific Center also includes a gathering hall, a student lounge, a study area and offices as well as a kitchen and quiet space. More information is available here. This recently completed fieldhouse renovation showcases numerous features of sustainability. The project is well within equivalency to LEED Gold, with 74 out of 110 possible points. For more information, see McAlexander's LEED Scorecard. Additionally, back in the early winter of 2009, the Department of Administrative Services (DAS) allowed the use of 2009 LEED CI (for Commercial Interiors) to document this project, rather than the out-of-date LEED 2.0 NC (for New Construction). McAlexander was the first DAS project in the state to use this standard. The McAlexander project netted $4,300 in incentives back to OSU from the state’s Energy Trust initiative, mostly for energy efficient lighting, including the first installation of LED fixtures as a standard, non-iconic lighting selection on a Yost Grube Hall Architecture (YGH) project. Also used were high efficiency, multi-switchable, 8-lamp fluorescent high bay fixtures for court and turf areas. In response to lessons-learned, lighting for the climbing wall resorted to standard inexpensively-lamped 2-foot and 4-foot linear fluorescents, allowing easy reconfiguration in future as needed. The SEED Report, prepared as required by DAS, shows a 51% improvement over code requirements for fan motors and 49% improvement over code for power to lighting. Cooling systems added for the classroom and office will save 22% over code requirements. While improving indoor air quality through the introduction of fresh air into the space, the heat recovery ventilator is expected to recover over 237,000 BTUS per winter heating season. Water efficient fixtures result in an expected 37% savings in water use. While an overall lighting calculation was not generated for the alternate skylight, the ability to include this component in the final contract will allow substantial avoidance of electric lighting for much of the year. This successful project will serve the students at OSU well for generations to come. The users, project managers, contractors, designers and the City all came together to meet the challenges inherent in a century old building that has seen a wide variety of functions over the years.